If you want to spice up your parties in a way that none of your friends or family have ever seen before, we’ve got just the thing. 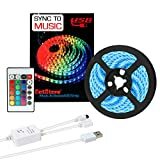 The DotStone Music LED Strip Light looks like any other LED light strip, but it has an awesome special mode. When enabled, the light strip flashes in sync with the beat of whatever music you play. It’s really cool, especially if the light strip is well placed in a dim room. You won’t find more fun for $16 anywhere.